According to their own website, Chowpatti in Arlington Heights has closed- from their website: "Thank You for 35 Memorable Years ! It’s Bittersweet for us to inform you that Chowpatti Bids Farewell. This decision was necessary to allow for our mom to retire." Also, Palm Court, also in Arlington Heights has a new owner. Honestly, I wasn't really a fan of Chowpatti, even though it was within walking distance of my house. I thought the portions didn't justify the prices, and just wasn't a fan of how it tasted. I do appreciate the diversity it brought to the area's restaurant options, especially in an underserved niche like vegetarian cuisine, and that it was a family-owned place. When I drove by last night, there seemed to be a temporary sign hanging out front, but I'm not sure if it was a "goodbye" from Chowpatti or an announcement for what's to come. I'll try to get a closer look next time I'm going passed. I've been to Palm Court a couple times and it's like a trip back in time, for better or for worse. Its "1987 Miami" charm has been remarkably well-maintained, and didn't suffer from the portion:price disparity that Chowpatti did. I hope it continues to stay in business, with maybe some updates, but only if it doesn't destroy the character of the place. Last edited by abe_froeman on January 30th, 2019, 8:52 am, edited 1 time in total. abe_froeman wrote: According to their own website, Chowpatti in Arlington Heights has closed- from their website: "Thank You for 35 Memorable Years ! It’s Bittersweet for us to inform you that Chowpatti Bids Farewell. This decision was necessary to allow for our mom to retire." Honestly, I wasn't really a fan of Chowpatti, even though it was within walking distance of my house. I thought the portions didn't justify the prices, and just wasn't a fan of how it tasted. I do appreciate the diversity it brought to the area's restaurant options, especially in an underserved niche like vegetarian cuisine, and that it was a family-owned place. We haven't been in years. At one point, it was the only Indian in this part of the burbs, and with several vegetarian friends, it was an occasional pre-movie meet point, at least until some of the friends moved further out. The prices were always a little outrageous, but they had some things like their 'loaded Indian nachos' that were worth coming back for. But with Indian, and south-Indian items like that sev batata puri more available in the suburbs, there hasn't been a reason to go. That dish inspired me to make my Indian 7-layer dip that I brought to at least one LTH event, and make regularly for family occasions. Honestly, I wasn't really a fan of Chowpatti, even though it was within walking distance of my house. I thought the portions didn't justify the prices, and just wasn't a fan of how it tasted. I do appreciate the diversity it brought to the area's restaurant options, especially in an underserved niche like vegetarian cuisine, and that it was a family-owned place. When I drove by last night, there seemed to be a temporary sign hanging out front, but I'm not sure if it was a "goodbye" from Chowpatti or an announcement for what's to come. I'll try to get a closer look next time I'm going past. While the original signage is still in the parking lot there is now a scrolling LED light in the window proclaiming "Tamales" and there have been a couple large signs with peppers attached to the building so looks like it is taking a new direction. I haven't seen an actual name of the new place put up yet though. Is Palm Court open now? Says they have a new owner but the website seems down. Danada Deli has relocated and is back open again serving delicious soups and Hungarian specialties. My favorites are the pea soup, the bean soup, the cream of cabbage soup, their egg salad sandwich, the stuffed peppers and the stuffed cabbage rolls. They are now located in a small strip mall in Wheaton at Roosevelt and Lorraine Streets. Yum!!! toria wrote: Is Palm Court open now? Says they have a new owner but the website seems down. It's open- I drove by last night and it was more packed than I've seen in awhile, especially unusual for a Tuesday night, but maybe the new owner was hosting family, friends, well-wishers, etc. The former Lake Zurich location of Siri Thai (115 S Rand Rd- closed a few years ago and has been empty since) has a building permit with "Kavkaz Grill and Bakery" on the door. I can't find any online presence, but the descriptions of other restaurants in the U.S. with "Kavkaz" in the name suggest it could be middle eastern, Mediterranean, Armenian perhaps? I know someone with the last name Kazkaz who is Syrian, so maybe they're related (by ethnicity, not literally)? Any of these possibilities would be a welcome addition as the diversity is pretty limited up here. I work up the street and have been lamenting the lack of a falafel/kebab-type place....*and* a bakery makes it extra exciting! “Kavkaz” is the Russian name for the Caucasus region, so probably Georgian (or possibly Armenian). Busghetti wrote: While the original signage is still in the parking lot there is now a scrolling LED light in the window proclaiming "Tamales" and there have been a couple large signs with peppers attached to the building so looks like it is taking a new direction. I haven't seen an actual name of the new place put up yet though. I pulled into the parking lot Friday night. The signs say "Speedy Tamales", and a Google search located a tamale truck by the same name. One of the pics on their FB page has a picture of the truck. The logo painted on the door and near the back of the truck that's partially cut off in the photo, with the peppers and the flame, matches the temporary signs on the former Chowpatti. Not much posted on the Facebook page, but I sent a message through there asking if they're the same place. ETA: They replied and confirmed they are the same people. Say they're just waiting on Arlington Heights to do their final inspection, probably in the next couple weeks. polster wrote: Hannosuke, the tempura stand at the Arlington Heights Mitsuwa Marketplace food court has closed. There is a sign a new restaurant in the same stall by the name Tokyo Shokudou is opening soon. Tokyo Shokudou is now open at the Mitsuwa Marketplace food court. Also noticed there doing a lot of remodeling at Mitsuwa Market including the sushi counter, frozen food refrigerators against the back wall, and raw fish counter all being renovated. Josh's On The Square (Josh's Hot Dogs) in Deerfield has closed. Really looking forward to the day it opens. Will send up a flare when it happens. Kesey wrote: Josh's On The Square (Josh's Hot Dogs) in Deerfield has closed. Can't say I didn't see this coming. That location is lousy. You literally have to only rely on people shopping in Deerfield Square to eat there. There is no signage on Deerfield Rd or Waukegan Rd (IL 43) so no one driving by will ever know it's there. It didn't help that Portillo's opened in Deerfield as well. It would bring a handful of Chinese restaurants you can find in NYC (mainly Flushing and Brooklyn) to the building such as 99 Favor Taste (hot pot), Hot Space (grilled fish), etc as well as a Chinese food court, and an 800 seat dim sum/Cantonese restaurant, along with a 43,000 sq foot Chinese/Asian grocery store and more non food related things (such as a new hotel). Not sure if it anything would be open in 2019, but just wanted to give people a little heads up. This is from the same company who is building the retail complex at Archer & Canal in Chinatown. Considering who purchased shares in them, I have to wonder what's coming to that retail complex (some Chinese restaurants from NYC..? Friend BBQ already opened in Chinatown afterall). Yep, but they don't talk about any of the things I covered for some reason, which is weird. Anyway, heads up. It has some pretty good backing to it, it looks like. Really curious if Chicago is about to get an influx of new Chinese restaurants from Flushing/Brooklyn Chinatown with what this company is doing (especially since they are building that new retail complex on Canal and Archer with 48 retail spaces). Greek Feast in Mount Prospect, a branch of the giant gyros cone in Northbrook, now has lit signage at the new location at Wolf and Kensington (formerly Photo's). No opening date posted yet. The Chicago House of Za Vegan Pizzeria is opening in the old Sola space (and the short lived Kick) near the corner of Lincoln and Byron. There are permit signs and a large banner. I'm not sure how close it is to opening (no furniture yet) but I have seen workers and family members in the space. Artists Cafe, the Michigan Avenue restaurant inside the historic Fine Arts Building, announced today it was closing, bringing down the curtain on nearly six decades of memories in Downtown Chicago. The Eater post describes their 16 other locations as in Michigan ("Mitten State"), but the company's statement just says the number of locations. Certainly wouldn't be Eater's first small oversight if they aren't all in Michigan. Chef Paul Virant, who owns the acclaimed Vie in Western Springs and the family-friendly Vistro in Hinsdale, both in the western suburbs, is opening his first Chicago restaurant since Perennial Virant closed. Gaijin (950 W. Lake St.), aiming for a summer opening, will be a casual 60-seater focused on okonomiyaki, a savory Japanese pancake filled with various ingredients. Scheduled for a midsummer opening, the 150-seat, 9,000-square-foot restaurant will evoke a “woodsy lodge feeling without it being a log cabin, without being Disneyland." Most are in Michigan but they do have locations in other states (Wisconsin, Indiana, Kentucky, Florida, Nebraska, Missouri.). Probably didn't help having another beer focused chain restaurant a few miles away (Yardhouse, which is owned by Darden). This is beyond great. We had the real deal in Osaka recently, and I hope they pull it off. My mouth has been watering ever since. Hello everyone. This is Sandy the owner; we will be temporarily closed for approximately two months for some renovations. We will notify you when the situation changes. Thank you for your patience and support. 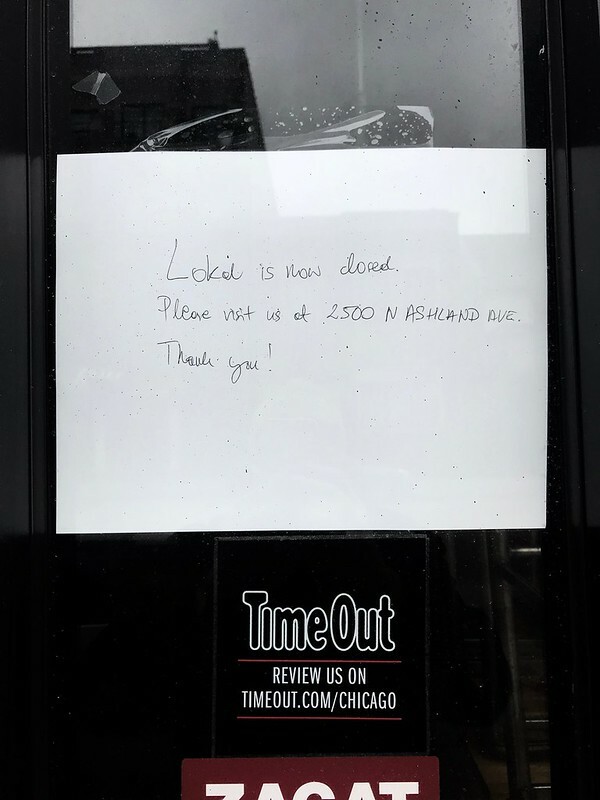 LOKAL on North Ave. is now closed.